I got the job of art critic for the Herald Tribune, but that wasn’t until May 1960. That didn’t pay anything but it did open the way to other things that did pay. Even after five years in the job I was only making about $30 an article, but they could pay slave wages because there were so many Americans in Paris who were dying for that kind of work. So I really just lived from hand to mouth. In 1961, in addition to his regular job at the Herald Tribune, Ashbery became the art critic for Art International, a magazine. He also wrote articles for ARTnews. In Number 8, 1949, the nervous energy of a pattern which seems to be made up of scythes and swear-words in Chinese is tempered by the sweet blue background. This contrast between form and color was to be the central idea in all the pictures Tomlin painted until his death in 1953. Stanzas in Meditation is no doubt the most successful of her attempts to do what can’t be done, to create a counterfeit reality more real than reality. And if, on laying the book aside, we feel that it is still impossible to accomplish the impossible, we are also left with the conviction that it is the only thing worth trying to do. The lines drift across the page as overheard human speech drifts across our hearing: fragments of conversation, dismembered advertising slogans or warning signs in the Metro appear and remain the rock crystal of the poem. And far from banishing poetry to the unconscious, he lets it move freely in and out of the conscious and unconscious. Since we do not inhabit either world exclusively, the result is moving and lifelike. Like Reverdy he has a keen ear for le langage de la tribu and a deep feeling for nature. Trees, clouds, lakes, automobiles, the texture of a woman’s skin and of her dress are shown for what they are and are also undetachable from the story being told; they are like electrodes in the limpid bath of a precise context. Already masterful in his ability to shift tone and focus, Ashbery has consciously rejected transparency, received notions of realism in poetry, and confession, all of which were (and still are) believed to be allegorical narratives that naturally culminate in revelation, universal truth, or epiphany. All too often, these states of illuminated insight are familiar and border on cliché. The revelation is not something the poet discovers in the process of writing, but is something he or she already possesses, and must figure out how to package. Such poems are full of detachable symbols and images, triggers that set off the reader’s sympathetic Pavlovian response. Ashbery is against both the predictable and the detachable, which allows a poem to be reduced to a theme or be summed up. Don’t poetry and art share the paradox of embodying a frozen time, while outside its domain, time (“autumn leaves”) keeps surging ahead? We live in a quandary, but it is not a dualistic conflict between inner and outer reality; it is rather a question of deciding how much the outer reality is our reality, how far we can advance into it and still keep a toe-hold on the inner, private one. Ashbery’s observation also applies to his choices as an art critic. For one thing, he has never been known as a critic who either celebrated hyperbolically or grumbled mightily about the work of artists that were or weren’t in the spotlight. I suspect this is because early on in his career he recognized that the outer reality (or what the art is intently focusing on at a particular moment) would subsume him if he advanced too far into it. After all, he chose to live in Paris, not New York. And he never tried to stay young and become the Paul McCartney of art criticism. This is what Ashbery says about artists and the critic’s relationship to them: “To create a work of art that the critic cannot even begin to talk about ought to be the artist’s chief concern.” He is championing art that exists outside of language, particularly when it is academic discourse. It might make his job tougher, but he is against any kind of art that can be explained by a preexisting discourse. Thus, in this same review of Brice Marden’s monochromatic paintings, he writes: “it is not an abstraction but an object made by and for the senses.” This observation is in line with his statements about art and poetry that is “lifelike,” and that moves between the conscious and unconscious. Ashbery is an heir to Walter Pater, who proposed that all art “aspires to the condition of the music.” The difference is that Pater is seen as paving the way for abstraction, while Ashbery began publishing poetry and criticism after abstraction’s triumph. Thus, he wants an abstract art that is an object made by and for the senses. In other words, he isn’t interested in abstraction as an idealized state, but in something messier and closer to life. He believes in art and writing that are autonomous but not removed from reality. This is why many find it nearly impossible to write about his poetry; it keeps slipping through one’s fingers and reconstituting itself just beyond one’s grasp. While Ashbery isn’t particularly interested in criticizing an artist’s work, one should not deduce that he wasn’t critical of artists, because he was, but in a way that can only be described as creative. Leland Bell is a painter and a polemicist. Seeing him in his studio, vigorously at work on a number of canvases and meanwhile sounding off on his various pet peeves and enthusiasms, one has the feeling of coming upon an almost extinct variety of a whooping crane, alive and well in its environment, happily honking around the pond and causing quite a commotion. For polemics, and by extension commitment — to art, that is — is all but extinct in the art world. Where polemics seem to flourish, it often turns out to be the wishful thinking of artists dedicated to the hopeless task of doing away with the art of the past, and must therefore be construed as a romantic metaphor rather than a practical exercise in persuasion. What is striking about Ashbery’s irreducible view of Bell is that it is simultaneously comical, critical, cold, entertaining, and even sympathetic. After all, none of us wants to see any animal, particularly a whooping crane, become extinct. Clearly, the tonal shifts and multiple voices that are an integral part of Ashbery’s poetry are also found mainly in his essays. Even though many of his essays are assignments and commissions that appear in art magazines and weekly journals, he has an original prose voice. He isn’t afraid of using a rich complex metaphor or citing a popular term. He isn’t a miser who feels compelled to hoard his metaphors for his poems. On the evidence of Selected Prose, in fact, it’s tempting to conclude that prose is something Ashbery isn’t especially good at, which makes him unusual among poets of his stature. Seamus Heaney and Derek Walcott, to take the two most obvious examples, are brilliant critics and essayists, with prose voices as original and pleasing as their poetic ones. Ashbery’s prose writing is clear and competent (he worked as a journalist and art critic for many years) but also dutiful and uninspired. Most of the pieces in this volume are the equivalent of literary chores — and from them you get no sense of how much fun Ashbery can be or what a master of tone and voices he is, able to shift gears in a single line. Most of Selected Prose is written in an all-purpose monotone. On the evidence of McGrath’s review, one is tempted to conclude that he never read Reported Sightings, and that being, as his byline describes him, “the former editor of the Book Review and a writer at large for the Times” means you don’t have to know a whole lot more about your subject than the average reader of your publication. Written more than a decade before the emergence of appropriationists, a number of whom were championed by Hal Foster, Ashbery’s observations regarding polemics have a particular relevance in both the art world and literary culture. One doesn’t think of what appropriation artists such as Mike Bidlo and Sherrie Levine do as being a “romantic metaphor,” and certainly that is not how their work has been framed and written about by art historians involved with postmodern pronouncements such as the death of originality and the death of the author. And while it certainly wasn’t on his mind when he wrote this in 1970, nearly a decade before the emergence of Language poets and others who (influenced by European theorists) proclaimed the death of the author, as heated arguments mounted against the use of “I,” it should be noted that Ashbery’s use of “I” is unlike that of any other poet. Ashbery’s “I” is porous and changing, and the reader doesn’t sense that it is connected to a fixed personality, as it is in the writing of James Tate, Charles Simic, or Jorie Graham, just to name three obvious examples. I would further suggest that something of the personality of such poets as Bruce Andrews, Charles Bernstein, and Leslie Scalapino comes through in their work. Thus, whether one uses or doesn’t use the “I,” and publicly believes in or doesn’t comment on the death of the author, isn’t really the point, is it? Making statements about these issues is really a way of announcing to others what club you belong to or are trying to be admitted to. Johns is one of the few young painters of today whose work seems to defy critical analysis, and this is precisely a sign of its power — it can’t be explained in any other terms than its own, and is therefore necessary. 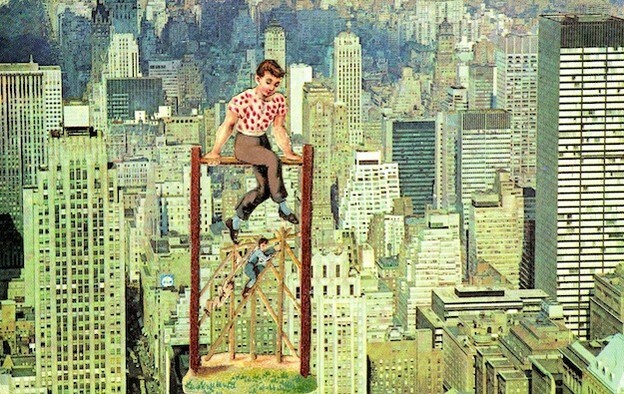 For more than four decades Ashbery has defined, defended, and championed the difficult and unexplainable, not because he is “a harebrained, homegrown surrealist,” but because he recognizes that the beginning of modernism, which is manifested by the poetry of Baudelaire and the painting of Manet, is marked by the collapse of collective language. How can you be edifying when there is no collective language or set of symbols to rely on? Within this situation of absence, particularly of moral authority, the writer has two choices: write poems as if there still existed a collective language or try to write poems that achieve complete autonomy. Ashbery chose the latter. Danube moves along towards the sea. Coming on this shoe fresh from Whitney’s [Edward] Hopper retrospective made me wonder once again if we really know who our greatest artists are. I would be the last to deny Hopper’s importance, but even in the smallest and most slapdash of these oil sketches, Dickinson seems to me a greater and more elevated painter, and all notions of “cerebralism” and “decadence” — two words critics throw around when they can’t find anything bad to say about an artist — are swept away by the freshness of these pictures, in which eeriness and vivacity seem to go hand in hand, as they do in our social life. Hopper, of course, is the artist everyone points to when they want to prove that a collective language of representation still exists. It is Hopper who many fervently claim most powerfully evokes our urban isolation and alienation, which is all well and good. At the same time, meaning has been detached from Hopper’s paintings, making them into a background against which a very programmatic conversation can unfold. Hopper is easy to sum up, while it is impossible to do so with Dickinson. However, without ever denying Hopper’s importance, Ashbery brings up “eeriness and vivacity” as aspects of our “social life” we might want to pay more attention to. Hopper hints at his figures’ inner life, but everything we see takes place on the painting’s surface. It is why so many mainstream poets have used Hopper’s paintings as a starting point. With Dickinson, however, it is all but moot to discuss what constitutes inner and outer reality. One of the painters that Ashbery became friends with while living in Paris was Jean Hélion, whom he championed many times. A provocative, commanding painter who challenges one’s assumptions about art, Hélion worked both abstractly and figuratively, and did not “attach much importance to the two categories.” He is impossible to categorize, and, in that way, is comparable to Philip Guston. The difference is that Hélion worked in four different modes of abstraction before shifting to figuration; he was both more stylistically restless and less seductive than Guston. Like Guston, Hélion tried to deal with dailiness after he moved away from abstraction. It so happens that there is a retrospective of Jean Hélion currently on tour. It opened at the Centre George Pompidou, Paris, and will have stops at the Museu Picasso, Barcelona, and the National Academy Museum, New York. The accompanying catalog contains essays by French, English, and American art historians. However, Ashbery’s early championing of Hélion — and he was pretty much one of the only American critics to do so — seems to have made no impression on any of the historians, and none of his writings are included in the English version of the catalogue. It is just another example of a lost opportunity. Being a poet and art critic means that much of your writing will appear in fugitive publications, in small magazines, middlebrow magazines with a short shelf life, and catalogues that only a few people will ever see or read. Most of the people who read the poetry probably won’t read the essays about art and vice versa. The mainstream literary establishment won’t pay much attention and that part of the literary establishment that thinks it is avant-garde or radical also won’t pay much attention because art, after all, makes money and therefore it must be corrupt. The art world still largely ignores poet-critics. And yet, despite the absence of attention in this area, and even though nobody might have bothered to notice, it must be apparent by now that Ashbery does take positions in his art criticism and literary essays, and that throughout his publishing life he has done so with remarkable clarity and precision. It seems not to have mattered to Ashbery whether or not someone read what he wrote about art. He would take a stand even if no one were listening. That, I believe, is the definition of integrity. Excerpted from “The Poet as Art Critic,” published in The American Poetry Review, May/June 2005. 1. John Ashbery in conversation with Mark Ford (London: Between the Lines, 2003), 43. 2. In contrast to many of the other abstract expressionists, Bradley Walker Tomlin (1899–1953) moved in both the commercial world and downtown bohemia. He was both a successful illustrator and painter. He designed covers for Vogue and House and Garden. In the last five years of his life, Tomlin used a vocabulary of ribbon-like calligraphic strokes, which are the temperamental opposite of Franz Kline’s clashing slathers of paint. Both Philip Guston and Robert Ryman have admired Tomlin’s tonalities and matter-of-fact, structural brushstrokes. 3. First published in ARTnews (October 1957). Reprinted in Reported Sightings: Art Chronicles 1957–1987, ed. David Bergman (New York: Alfred A. Knopf, 1989), 193. 4. First published in Poetry 90, no. 4 (July 1957). Reprinted in Selected Prose, ed. Eugene Ritchie (Ann Arbor: University of Michigan Press, 2004), 15. 4. First published in Evergreen Review 4, no. 11 (January–February 1960). Reprinted in Selected Prose, 21. 8. John Ashbery, “Throughout Is This Quality of Thingness: Elizabeth Bishop,” in Selected Prose. First published in the New York Times Book Review, June 1, 1969. For those who are interested in the degree to which Ashbery has dissolved the distinction between inner and outer realities, I would recommend they compare the early poem “The Instruction Manual,” which makes a clear distinction between these two realms, to his recent poem “Interesting People of Newfoundland,” where one is unable to apply such distinctions. 9. First published in Portfolio and ARTnews Annual 2 (1960). Reprinted in Selected Prose, 32. 10. “Brice Marden,” first published in ARTnews, March 1972. Reprinted in Reported Sightings, 214. 12. First published in ARTnews (February 1970). Reprinted in Reported Sightings: Art Chronicles 1957–1987, ed. David Bergman (New York: Alfred A. Knopf, 1989), 195. 13. Charles McGrath, “Mapping the Unconscious,” New York Times Book Review, March 6, 2005, 10. McGrath reviews both Where Shall I Wander (New York: HarperCollins 2005) and Selected Prose. 14. First published in ARTnews 65, no. 3 (March, 1966). Reprinted in Selected Prose, 69. 15. “Second Presentation of Elizabeth Bishop,” in Selected Prose, 164. 17. From the manifesto authored by Theo Van Doesburg that appeared in Art Concret, no. 1 (April 1930): 1. 18. “Jean Hélion Paints a Picture,” in Reported Sightings, 65. 19. Although I haven’t been able to verify this, I’ve been told that an essay by Ashbery is reprinted in the French and Catalan versions of the catalogue.